It is snowing outside. Big, fluffy snowflakes are falling silently from the sky, piling up on window frames and tree branches. The world is covered with white, a blanket of fleece matching the stark ivory of the cloudy sky. Snug and warm in my house, I want to wrap a blanket around my shoulders with a cup of tea in hand, gazing at the postcard outside my window in the soft light of morning. Even though I live in a cold climate, where winter seems to compose half of the year's weather, it is moments like this that make the ice and the cold worth all of those chilled months. I cannot imagine a winter without snow. 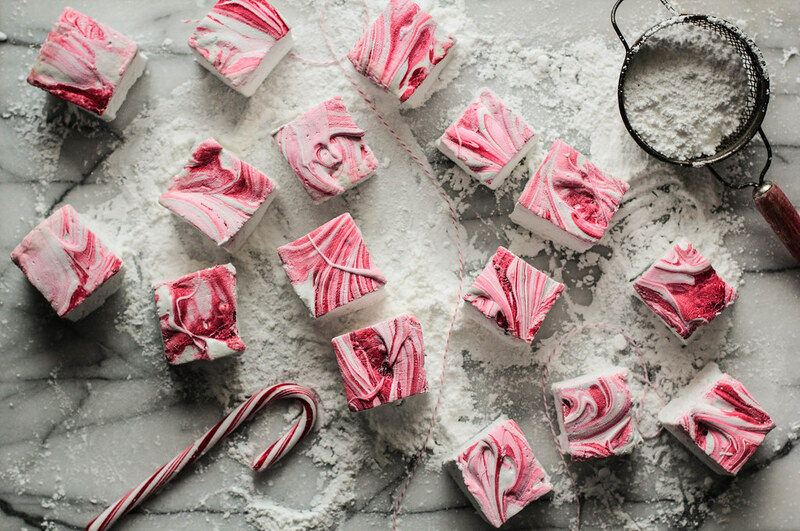 The appearance of candy canes usually marks the beginning of winter for me. The occasional seasonal snow that comes and goes has finally settled in for a long visit and the time has come to bundle up with winter scarves and over-sized mittens. 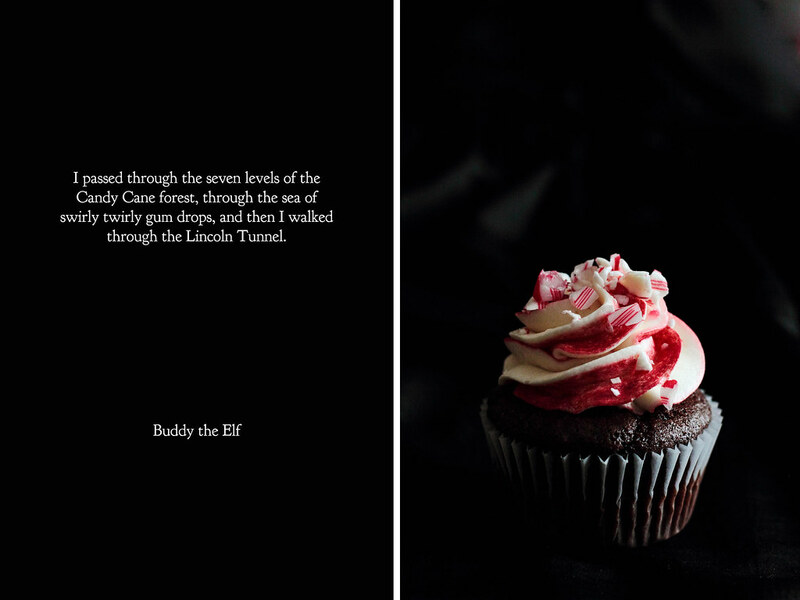 Candy canes were an intrinsic part of the holiday culture of my childhood. 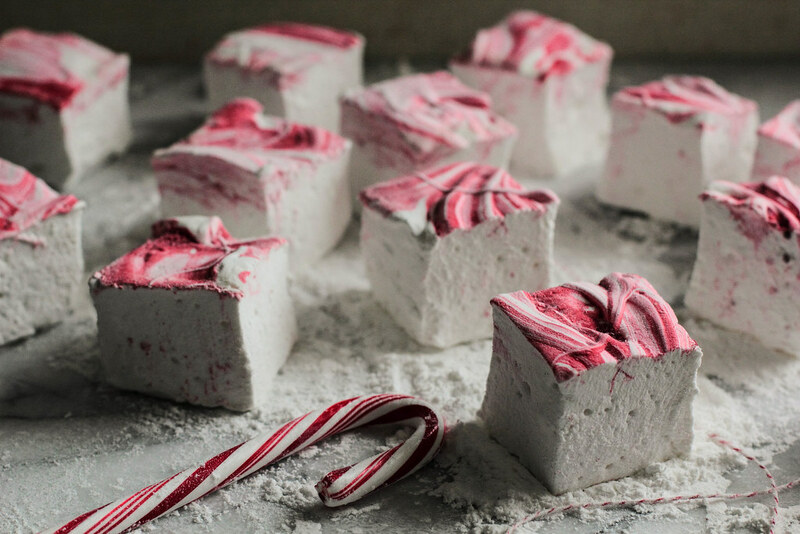 Candy canes weaved themselves into classrooms and daycare, sneaking into craft corners and making an appearance as ornaments on the tree. 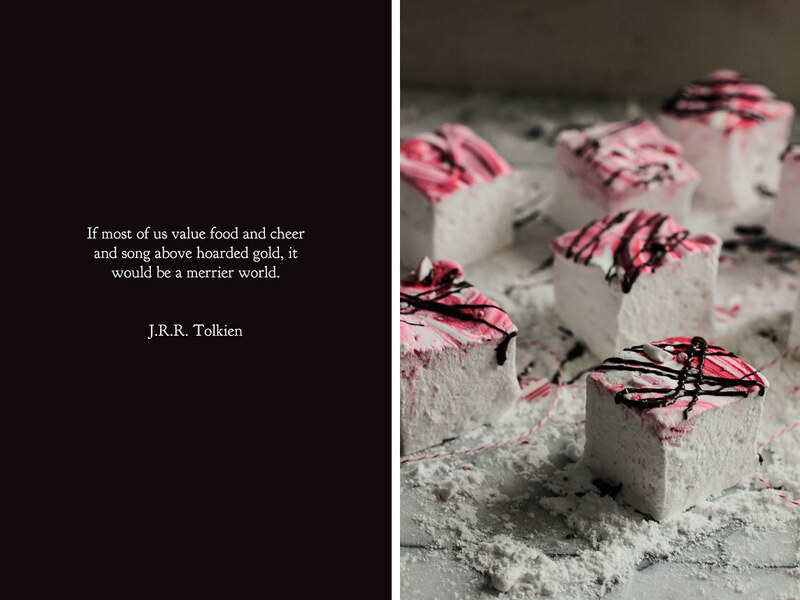 Even when I was small, I loved the idea of candy canes, enjoying the way the colored stripes twirled themselves up the length of the candy stick. I didn't, however, enjoy the taste. 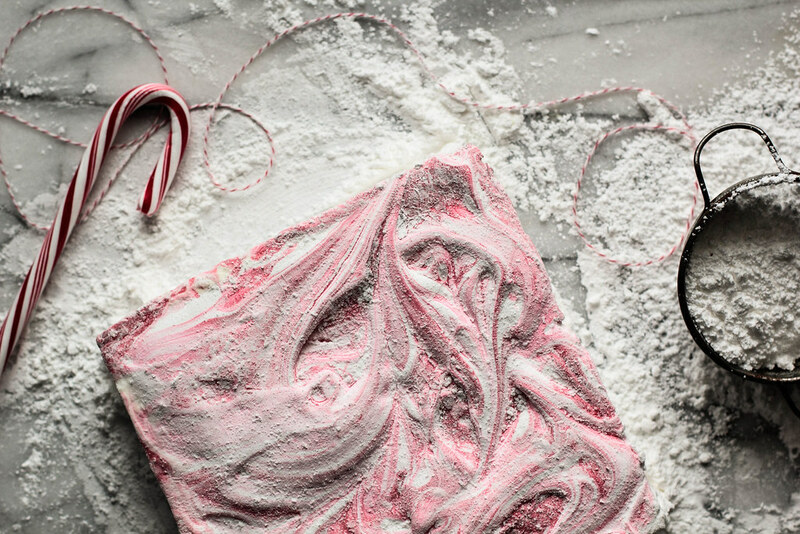 Each year I made it my mission to like candy canes, trying another one just to see if my tastes have changed. Even now, years after my pursuit began, I may not have completed my mission, but I can assure you I have come so much closer. 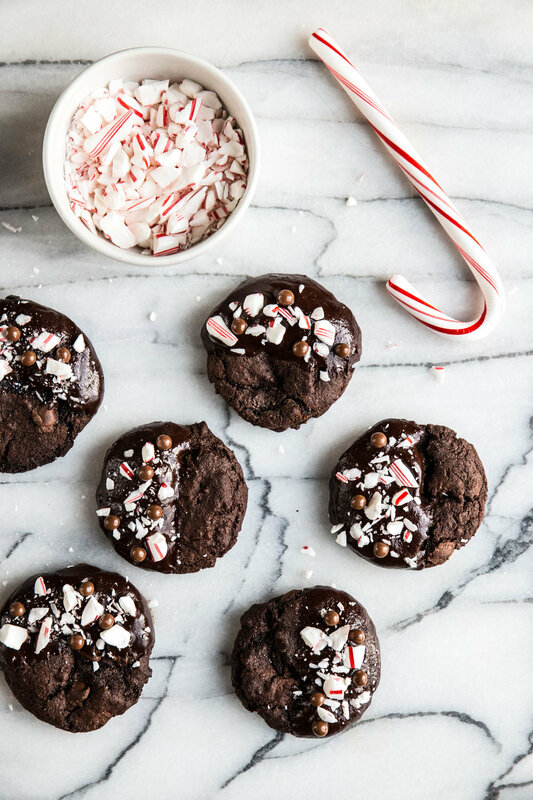 Though I may not enjoy a candy cane by itself, I adore it in combination with a few of my favorite treats, such as hot chocolate, ice cream, or even popcorn. After coming home for the holidays, I noticed a stash of candy canes hidden away in the candy cupboard. The timing seemed right to put them to good use. 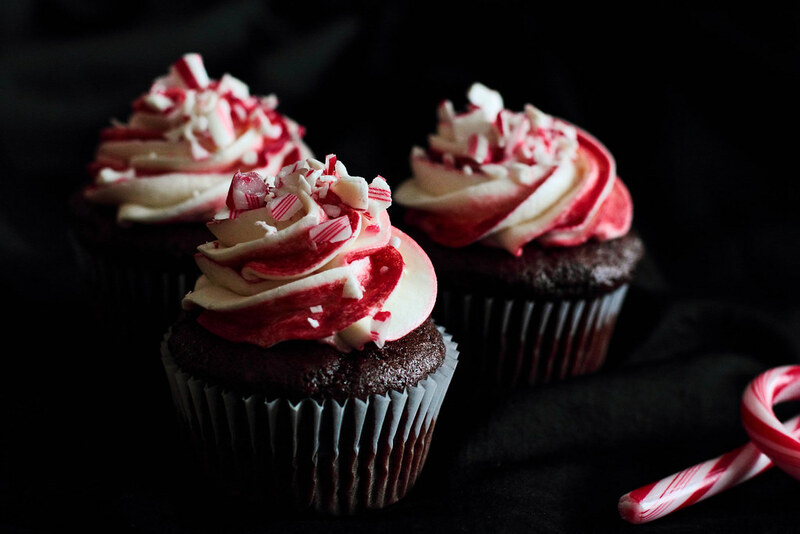 While some children may have visions of sugarplums dancing in their heads, I had visions of these cupcakes, with a candy striped peppermint frosting to bring in the flavors of the classic candy cane. 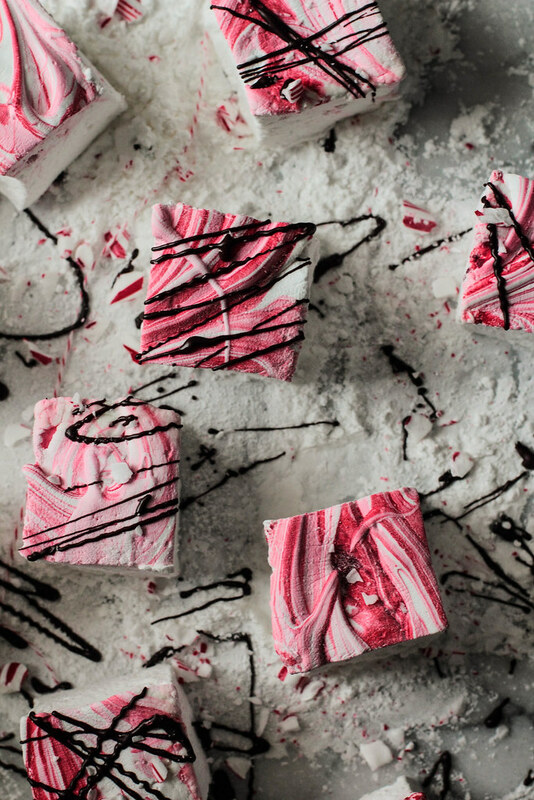 Though the candy striped swirl may appear complex, I can assure you that the effect is quite easy to achieve. 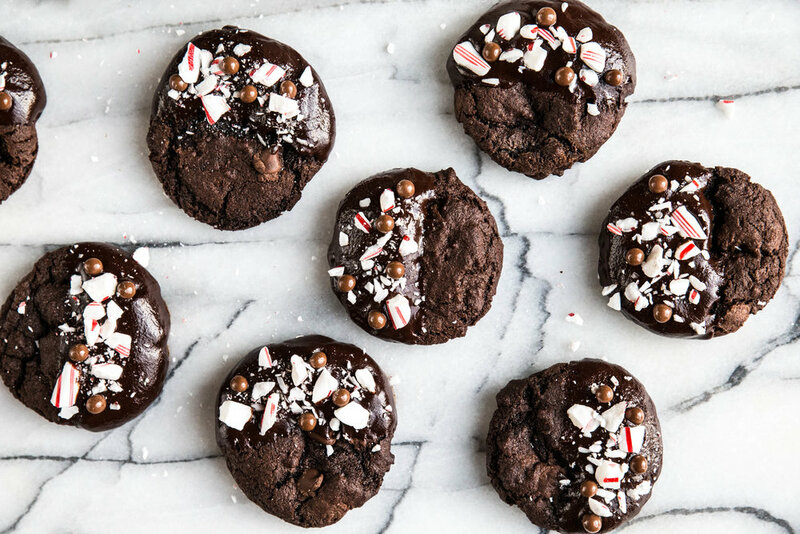 This might be one of my favorite ways to enjoy candy canes yet. 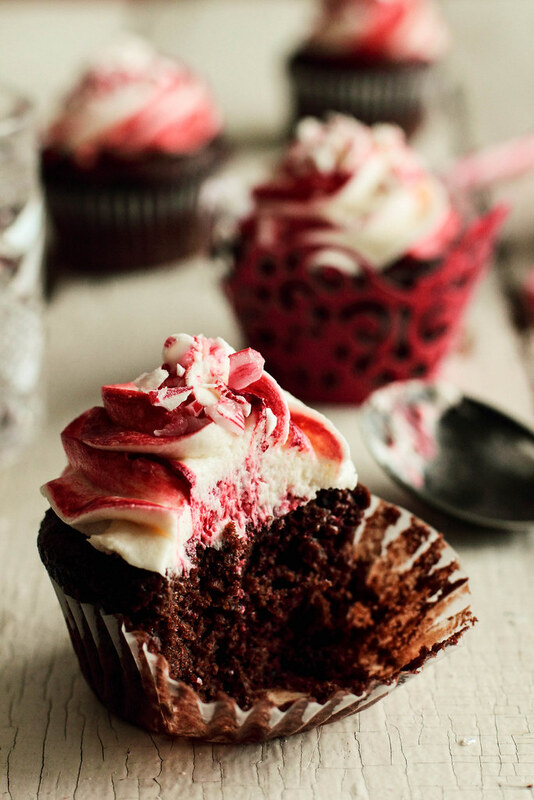 Candy Cane Cupcakes feature a rich peppermint buttercream on top of a chocolate cupcake. 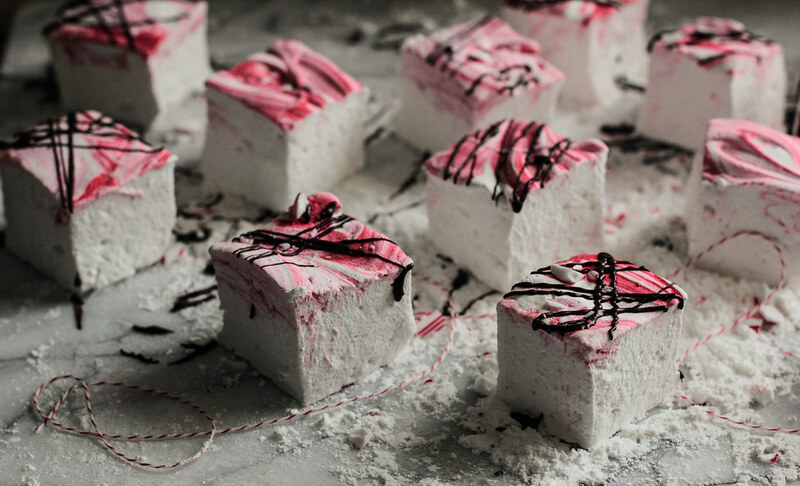 Though buttercream frosting has a tendency to get too sweet, this frosting has a good amount of salt to cut back on the sweetness. 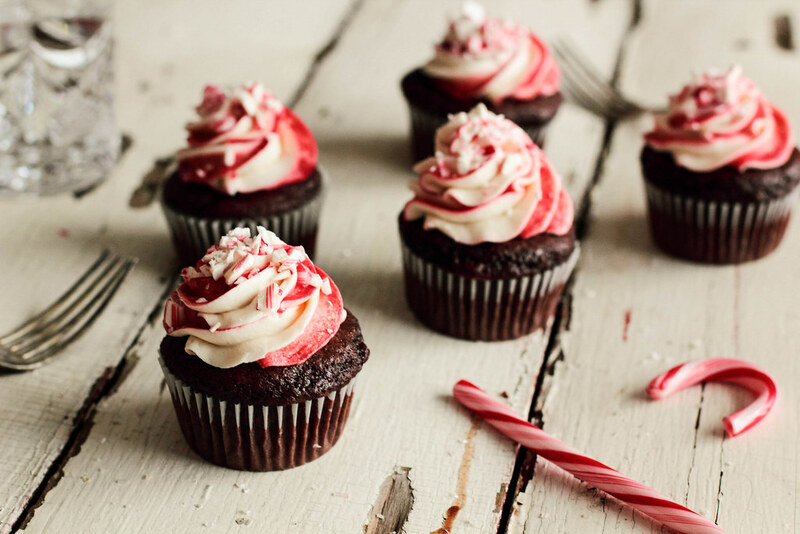 The stripes in the frosting are created with red gel food coloring to give it a genuine candy cane feel. 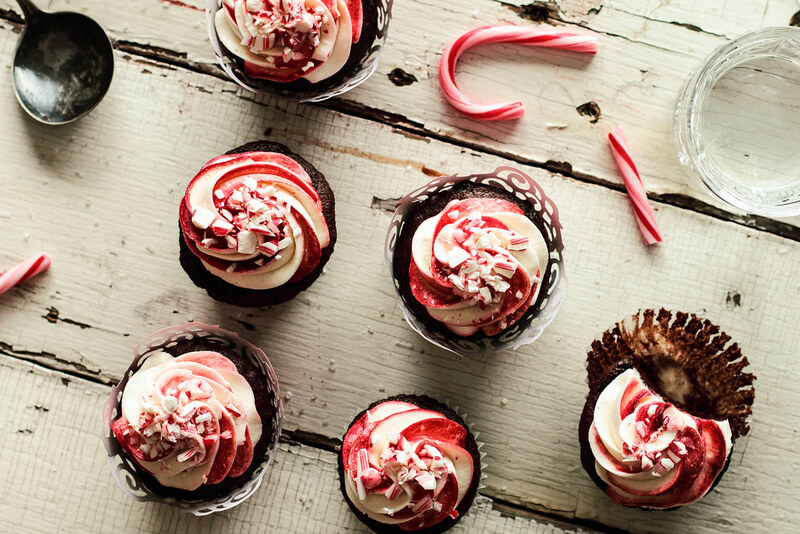 Sprinkled with a few crushed candy canes, the cupcakes come together to create a festive holiday treat.